Is it ever okay to repeat the same word or phrase in your writing? Unintentional repetition is something that authors are (quite rightly) warned to watch out for, particularly in fiction. Like most authors, I have a tendency to fall back on the same words or phrase a little too frequently … without really noticing. My editor, Lorna Fergusson from Fictionfire, is great at picking these up for me! When you’re editing your own work, or reading a piece for another writer, look out for the same word being used too often within a short passage of text. John stormed back into the room. “Back off!” he yelled. Steven was taken aback; he’d thought the argument was over. He backed away. The problem here is that the repetition and near-repetition of “back” isn’t creating a meaningful effect. Instead, it starts to jar; it feels almost comical. Note too that the word “back” isn’t being used with quite the same sense each time: this can make it hard to spot repetition when you’re drafting. John stormed back into the room. “Just leave it!” he yelled. Steven was taken by surprise; he’d thought the argument was over. He edged away. On a larger scale, it can be tricky to see when the same words or phrases recur a bit too often, especially in your own work. A useful trick here is, when you think you have one, to run a find and replace in your manuscript to see how often it comes up (and potentially to highlight occurrences). So how do you get repetition right? It’s easy to see repetition at work when a fair proportion of the overall text is repeated: in a children’s book, for instance. (Large scale: in a series of books) All your novels start in a particular way, for instance – with a prologue or a letter or a phone call or a murder or whatever works for you and your genre. (Small scale: within a paragraph or list) Your non-fiction book uses repetition from time to time to reinforce a point that you want readers to remember. Think of all the fairytales you know that involve three: The Three Little Pigs, The Three Billy Goats Gruff, Goldilocks and the Three Bears … the number three works very well when you’re repeating something. Three allows you to establish a pattern then break it for effect (in all of those stories): you have the set up of “normal” with the first two, then the surprise twist with the third. Three is also memorable. (Think “stop, drop and roll”, for instance.) If you want people to remember what you’re telling them, then coming up with three key points will work a lot better than five. Here’s one classic example: you can find plenty more – and more about the rule of three – here. Simply being deliberate isn’t enough to make repetition work. The repetition should matter. In a poem or children’s story, it might give structure to the piece – or build a sense of anticipation. 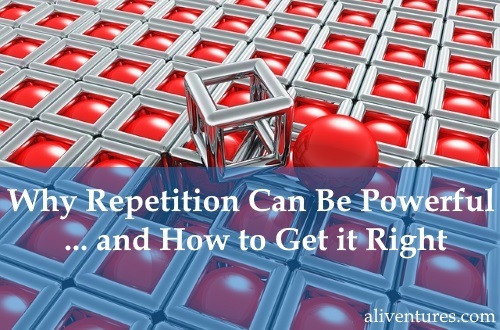 In non-fiction, repetition is generally used to help make key points stick in the reader’s mind. In a novel, it might be used to help link two scenes (potentially to create a sense of contrast or even humour). Repetition could also be significant for the plot. For instance, if you’re writing a novel where a particular phrase has been repeatedly associated with the antagonist, and that phrase comes up in a letter purporting to be from a different character, it could be a clue to the reader (and the protagonist) that something’s amiss. With the next book you read, whether it’s a novel trilogy (there’s that rule of three again…) or a children’s book, watch out for repetition. How’s it being used? Is it effective? Think about how you might use repetition in your own work – in large and small ways – to add extra depth or make it more memorable. 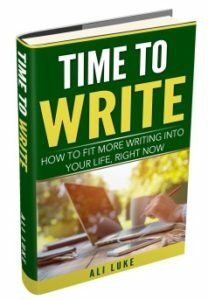 Would you like weekly writing tips and inspiration straight to your inbox? All I read about repetitive words is that one should avoid it. Of course, I have no idea about novel writing, which is why your point of view is important for me. I’d love to read a blog post on common writing mistakes that bloggers make. Could you write that?